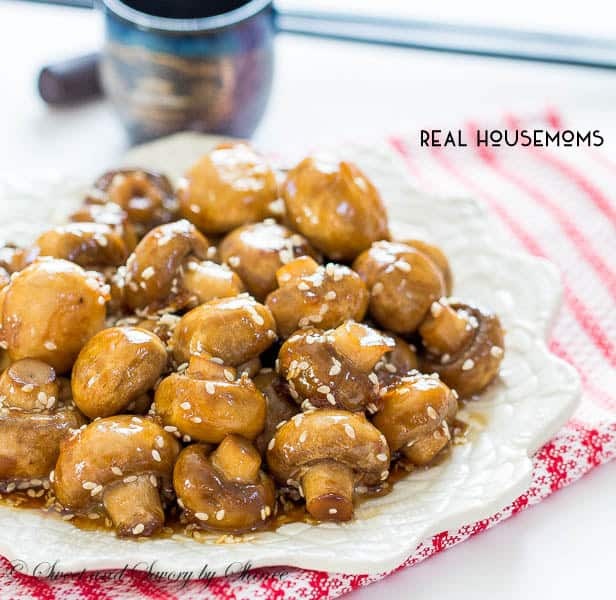 These Asian-style sesame garlic mushrooms are delicious and healthy-ish side dish that requires very little hands-on time. I simply adore toasted sesame seed oil. It has this unique nutty toasty smell and adds awesome flavor to any dish. Compared to pure sesame seed oil, toasted sesame oil has darker color and stronger flavor, while pure one is much milder. Another unusual ingredient in today’s recipe is Mirin, a sweet Japanese rice wine that is used mostly in cooking. 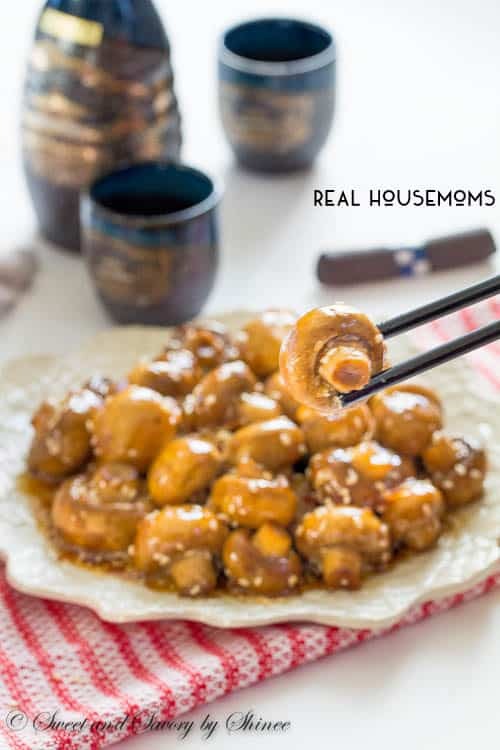 It pairs beautifully with soy sauce and sesame seed oil, adding slight sweetness to the dish. 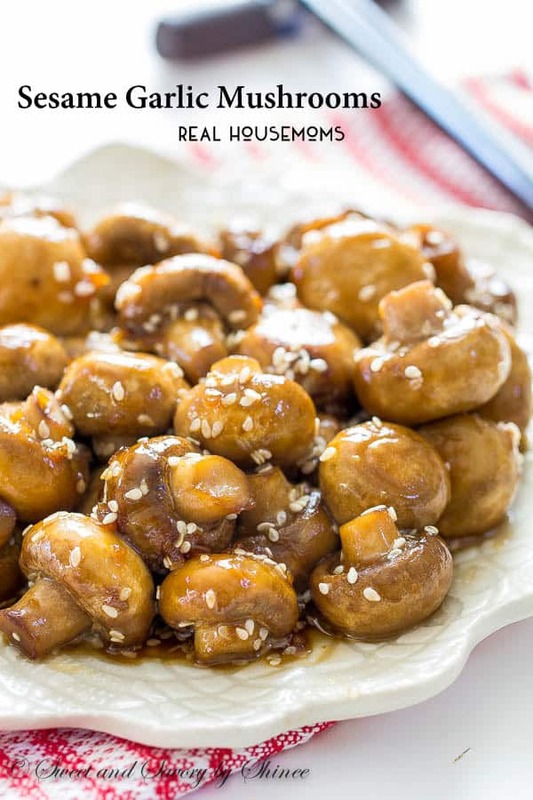 These mushrooms burst with nutty sweet flavors. Sizzling butter and toasted sesame seed oil bring nutty factor, while Mirin and honey add sweetness. And sesame seeds lend fun texture and add sprinkle factor to this dish. Hope you enjoyed this healthy snacks recipes! 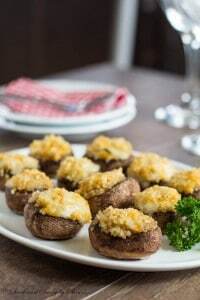 What is your favorite way to cook mushrooms? Melt the butter in a large skillet over medium high heat. Add 1 tablespoon of sesame seed oil and mushrooms. Sauté the mushrooms stirring occasionally for about 8-10 minutes on medium high heat. Stir in minced garlic, sesame seeds, mirin, soy sauce and honey. Continue to cook for another 3-5 minutes. I am the blogger and photograph behind Sweet and Savory by Shinee. My food blog is all about various finger foods, bite-size desserts & appetizers, cake, and cocktails. It's always party time on my blog! Come and join me. this is wonderful!! Both my favorite mushrooms and garlic in one dish! !